OMAHA — April 25, 2018 — At age 11, Katie van der Mars watched as American Ballet Theater (ABT) presented a televised performance of The Dream, a ballet version of William Shakespeare’s classically comedic tale of feuding fairies, misunderstandings, and love on a midsummer’s night. 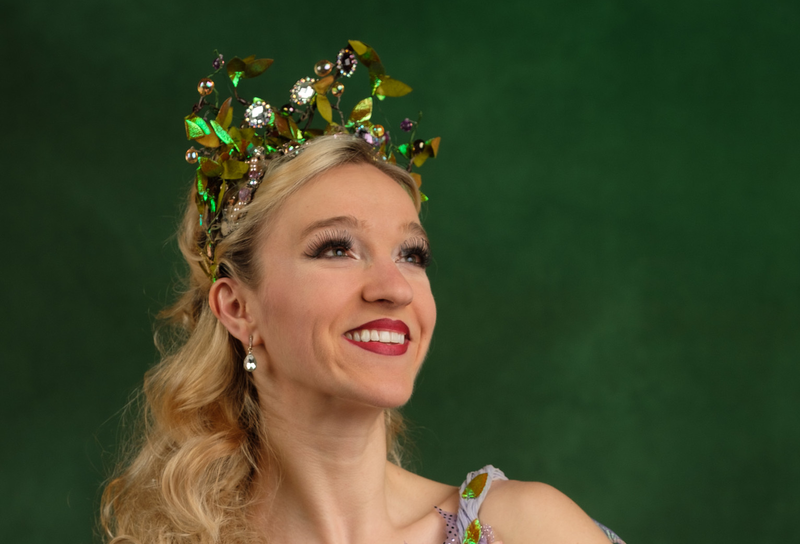 In less than two weeks, Katie takes the stage herself as Titania, Queen of the Fairies, in Ballet Nebraska’s production of Oskar Antunez’ A Midsummer Night’s Dream at the Orpheum Theater on May 5 and 6. What does it mean to you to dance the role of Titania? As a child, I was so taken by ABT’s version of this Shakespearean classic. I would have never imagined I’d get the opportunity to dance Titania back then. I’m excited to portray a leading role in a story ballet where the dancing and the narrative are equally important. How do you prepare for the emotional and physical challenges that lead roles entail? Emotionally, nerves can be nearly debilitating. Early on, I would put unnecessary pressure on myself. I went through a phase where if even the smallest detail felt off during a show, the whole evening was ruined in my mind. It was a tough time. I had to learn how to relax, take each entrance one at a time and just be me out there. And physically? Depending on the repertoire, our company teachers will often tailor class to help with the physical aspects of ballet rehearsals later that day, which is helpful. I also do cross-training to increase my stamina and stay balanced. On my own time, I watch other portrayals of roles I’m cast in to see what I like and what I can build upon. Tell us about your experience learning this role. The majority of my rehearsals were with [artistic director] Erika Overturff, who also danced as Titania in Ballet Nebraska’s 2011 production. It is so much dancing! Act One is where the majority of Titania’s solo dancing and interaction with her four fairies takes place. The dancing ranges from allegro (fast jumping) to slower adagio sections that require more control. Act Two is where Titania performs all of her pas de deux. The first hurdle was to fit all of the choreography in my brain and master the detailed musicality. Layering the character on top of all that has been the most fun to explore. The section I was most excited to learn was the pas de deux with [fellow dancer] Ryan Christopher, when Titania falls in love with Bottom, the donkey-headed man. When I dance that part, I imagine I’m snuggling my golden retriever, Lil’ Sebastian. What has the ballet journey been like for you? I feel incredibly grateful to call this my career. Being part of this company is such a dream come true for me. The best part of dancing roles like Titania or Sugar Plum Fairy is interacting with all the little ones involved in the production. There’s always a “pinch-me moment” in knowing that you are influencing future little dancers. I remember so vividly being in their shoes and looking up to the “big girls”. Time flies! When you’re at a ballet as an audience member, what do you watch? I love watching the corps de ballet! I know how challenging it is to dance that hard as part of a group while staying in line and maintaining formations. My blood starts pumping when I watch beautiful dancing and sometimes I even get a little sweaty! It’s kind of embarrassing [laughs]; but it’s like my body is dancing right along with them onstage. Is there anything you wished you knew as a student about the life of a professional dancer? Hard work and humility will never go unnoticed. True success in this career doesn’t come from what your casting is or how many pirouettes you can do. The audience is more moved by the humanity you bring to the stage. Taking pride in each moment when you are on stage, and being kind and supportive of your fellow dancers is what you’ll always remember. And always pack extra snacks. You are hungry constantly! Catch Katie van der Mars’ performance as Titania in Ballet Nebraska’s production of A Midsummer Night’s Dream at the Orpheum Theater in Omaha on Sat., May 5 at 7:30 p.m. and Sun., May 6 at 2:00 p.m.